Some guys are Ohio, and some are Ohio. Tom Arth is the latter. Akron’s new head coach was born in a Cleveland suburb, attended Saint Ignatius High in Cleveland, then started for four years at Division III John Carroll in another Cleveland suburb. After a pro career that included stops with the Indianapolis Colts (cough) and the Grand Rapids Rampage, Arth began coaching in 2010 at his alma mater, and within three years he was head coach. He won 40 games in four years in charge of the Blue Streaks, and he was in charge when John Carroll broke Mount Union’s 112-game regular season winning streak. After a gut-wrenching loss to UW-Oshkosh in the 2016 D3 semifinals, Arth took the Tennessee-Chattanooga job, but his mojo wasn’t quite the same outside of Ohio. After a 3-8 debut, he went 6-5 in 2018 and then back home. In need of energy after dismissing Terry Bowden, Akron paid a reasonably costly buyout to bring Arth back to Northeastern Ohio. One can understand the draw. This is an awfully tricky time for Akron. Finances are an issue, which has bled into athletics. And football is such an all-or-nothing risk. If you invest in a winner, it can build campus morale and pay for an athletic department. If you invest and fail, you’ll pay for years. 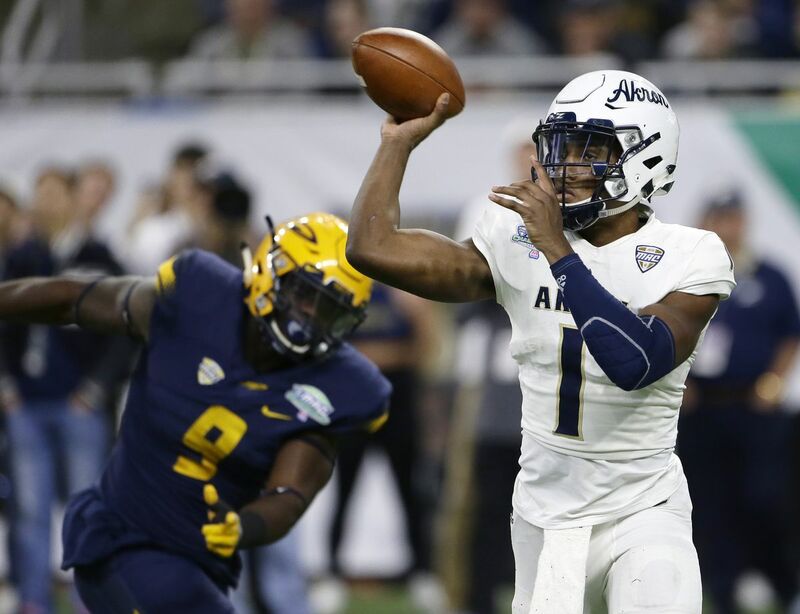 With Arth, Akron’s trying to thread a needle. The buyout situation (both for him and Bowden) means a significant investment, but as an under-40 coach with nine career wins above the D3 level, his salary is nothing particularly luxurious. If Arth can use his energy and NE Ohio ties to build an interesting program, he could turn out to be worth the investment. But as with most MAC programs, this is a hard job. Bowden did it for a while, though. The Zips had been to just one bowl before Bowden took them to the 2015 Idaho Potato Bowl and 2017 Boca Raton Bowl. They won the 2017 MAC East title, though their No. 121 S&P+ ranking from that season (and their 17-point loss to Toledo in Detroit) suggest they were awfully lucky. In 2018, the luck ran out. They “improved” to 120th in S&P+, but their offense cratered to 128th in Off. S&P+. They dealt with injuries in basically every unit — quarterback Kato Nelson missed one game and hobbled through others, and only one skill position regular played in all 12 games. Close conference wins over Kent State and CMU and a lucky-as-hell upset of Northwestern (postgame win expectancy: 25 percent) keyed a 4-3 start, but the Zips lost their final five games by double digits, and the 62-year-old Bowden was let go. Injuries lead to experience, at least. Arth inherits a dual-threat in Nelson (more of a threat with his legs than his arm, but it still counts), plus explosive junior receivers in Andre Williams and Jonah Morris and four offensive linemen with a combined 63 career starts. Plus, quite a few sophomores-to-be saw more time than expected — quarterback Alex Ramart, running backs Keyondre White and Jemarulin Suggs, receivers Jeremiah Knight and Daishawn Brimage, etc. Outside of left tackle Trevor Brown and maybe running back Deltron Sands, almost anybody who contributes to this offense in 2019 will return in 2020. The focus should be on 2020. There’s experience on offense, sure, but it was the third-worst in FBS. And a defense that boasted most of the team’s better 2018 moments has to replace four of its top five linemen, two of three linebackers, and three of five defensive backs. Depth is perilous on D, and as Arth was introduced as head coach on December 17 — the same week as National Signing Day — he played a major game of catch-up for his first recruiting class. Even if energy pays off, it’s going to take a bit. The one time an Arth team has taken on an FBS opponent was pretty telling. Against LSU in a 45-10 loss in 2017, Chattanooga came out firing. Quarterback Nick Tiano threw on seven consecutive snaps at one point, and the Mocs converted a fourth-and-2 before settling for a 22-yard field goal. UTC attempted 37 passes to 22 rushes for the game, and while that was a little extreme, this was still a pass-first unit in 2018. Counting sacks as pass attempts, the Mocs rushed only 44 percent of the time last fall, leaning on Tiano’s arm as RBs carried only about 20 times per game. Tiano completed 62 percent of his passes at 11.6 yards per completion, suggesting an efficiency-based attack. That could mean some growing pains in 2019. Over parts of two seasons, Nelson has completed only 51 percent of his passes; granted, a lot of that is because he was asked (or told himself) to throw deep. In a more horizontal system, he might be fine. But Nelson was far scarier when running than when throwing, and that could open the door for either Ramart or three-star freshman Zach Gibson. That’s what Ramart and Gibson are telling themselves, anyway. The QB will have a pretty exciting receiving corps, at least. Williams and Morris, a high-three-star former Indiana signee, each averaged over 14 yards per catch last season, albeit with success rates below 40 percent, while junior Nate Stewart and Knight combined for a 63 percent catch rate. Williams was a difference maker. 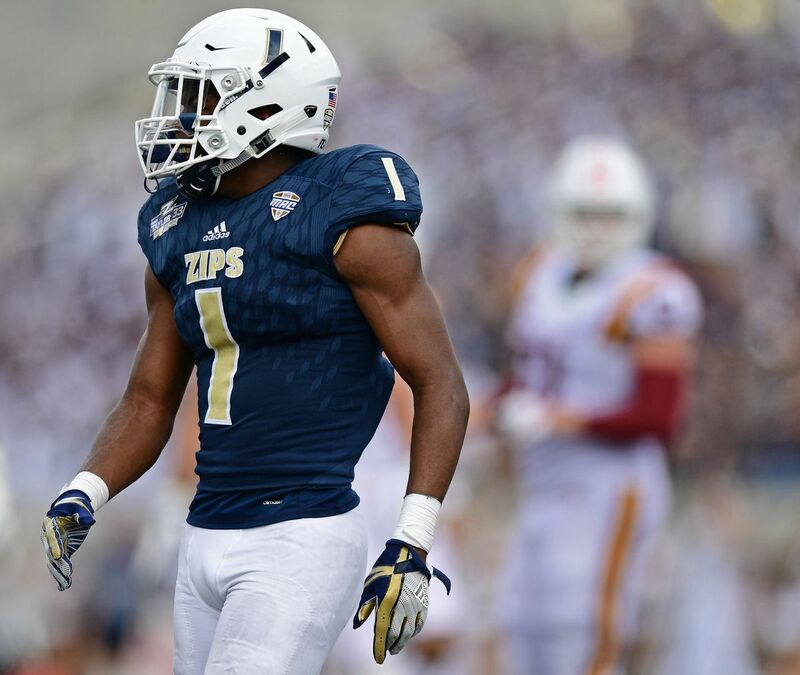 In maybe Akron’s three most impressive offensive performances (Northwestern, Kent State, and NIU), he caught 15 passes for 286 yards (five catches per game, 19.1 yards per catch); in his other eight games, he caught 31 for just 363 (3.9 and 11.7, respectively). Without the occasional vertical success, though, this offense went nowhere. The run game was putrid — the Zips were 129th in Rushing S&P+ and 121st in rushing marginal explosiveness. 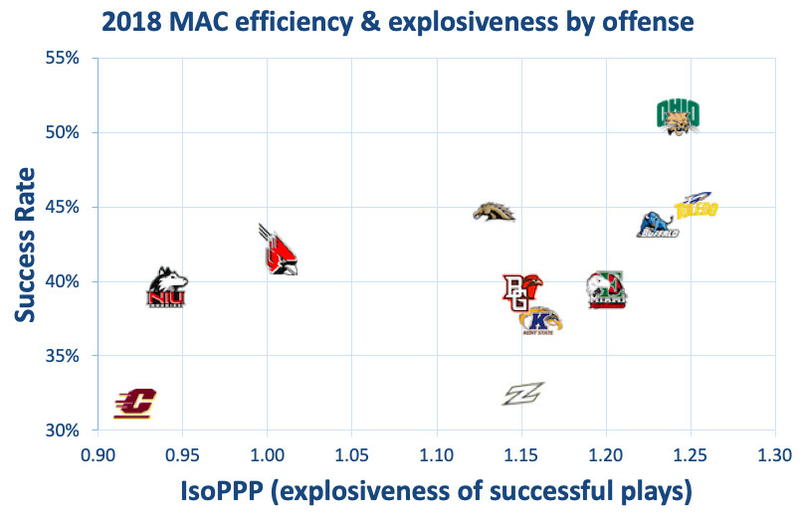 Van Edwards Jr. was the least inefficient and least un-explosive back Akron had, and he’s gone, but his numbers weren’t good enough to really be missed. 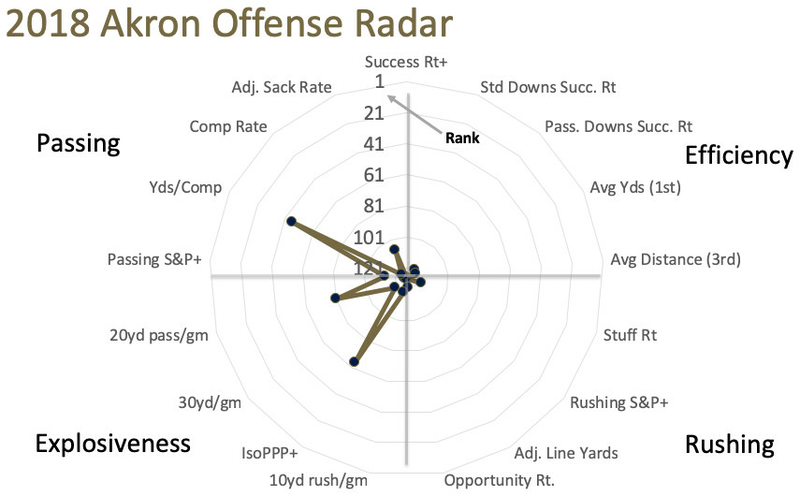 In a perfect world, Akron finds enough success with a quick passing game that it pulls defenders out of the box for the run game and baits defenses into getting burned deep. But even if the horizontal game works, the line and backs (senior Deltron Sands, plus the two sophomores and maybe three-star redshirt freshman Abraham Alce) need to take advantage of a thinner box, and Nelson has to hit the deep shots. It’s hard to bet on that. Coordinator Matt Feeney follows Arth from Chattanooga, where he took over the defense in 2018 as opponents’ output sank by 4.8 points per game. UTC was solid against the run (4.6 yards per carry, not including sacks) and good against the pass (58 percent completion rate, 11.6 yards per completion, 8.4 percent sack rate). 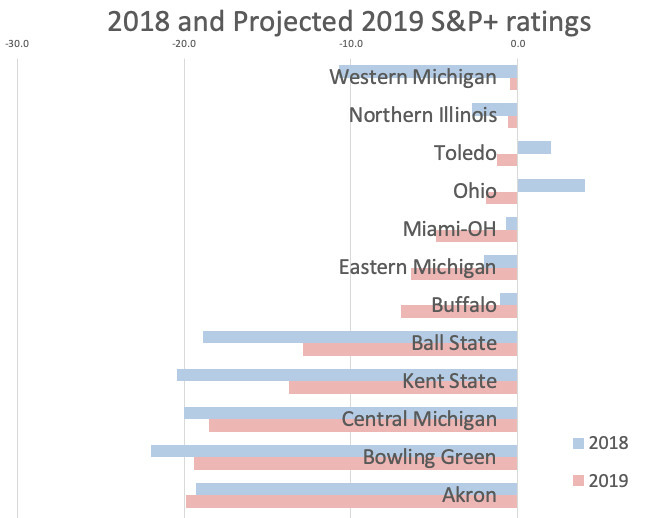 That matches with Akron’s 2018 strengths and weaknesses, though personnel changes could change that. 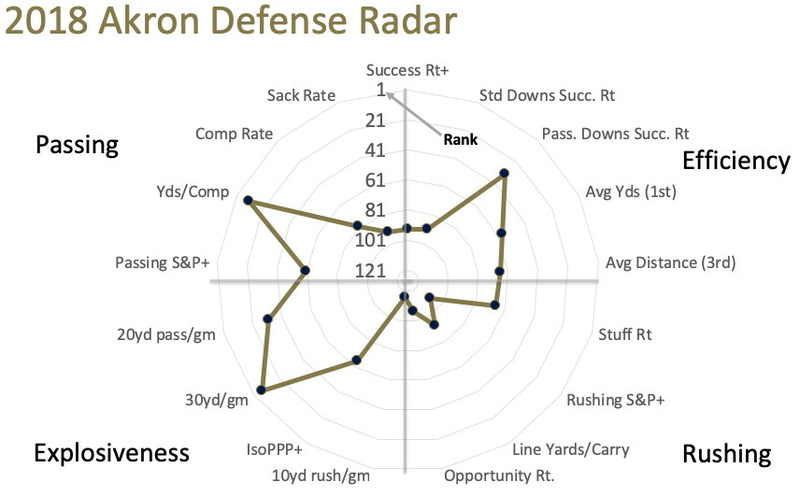 The good news: the Akron defense rebounded after a horrid 2017. The Zips improved from 120th in Def. S&P+ to 89th — not quite at the standard of Bowden/Chuck Amato defenses (64th in 2016, 55th in 2015) but better. The bad news: most of the reasons are gone. Four of last year’s top six havoc producers (tackles for loss, passes defensed, forced fumbles) are gone, including a dynamic linemen in end Jamal Davis II (16 TFLs, 5.5 sacks, seven passes defensed). Senior linebacker John Lako (10 TFLs, three PDs) does return, as do safeties Alvin Davis (seven PDs) and Shawn Featherstone, a key 2017 piece who missed almost all of last season with injury. Still, depth takes a massive hit, and most known play-makers are gone. 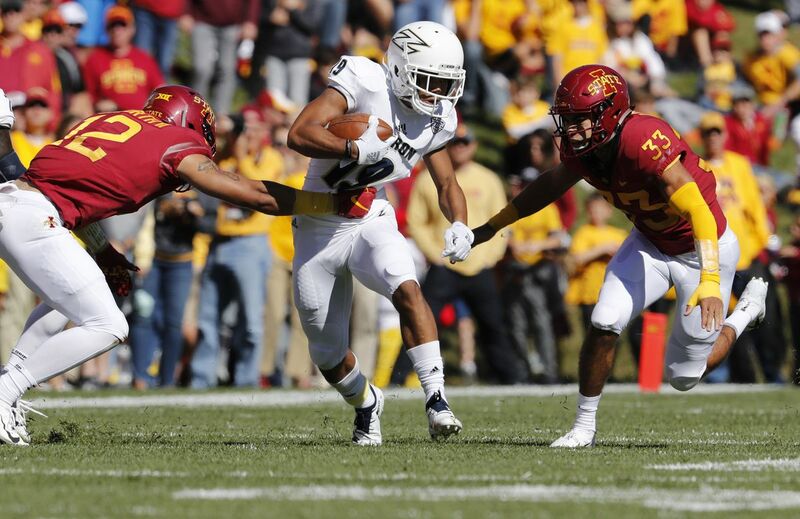 Featherstone’s return helps, but the hit to the pass defense is disconcerting. Akron ranked 32nd in passing marginal efficiency and 17th in passing marginal explosiveness and now has to replace corners Kyron Brown, Denzel Butler, and Darian Dailey, who combined for four INTs, 15 breakups, and four TFLs. The most experienced corner from last year’s depth chart is now sophomore Jordyn Riley, who played in three games. That newcomers could man the two-deep in what was last year’s biggest area of strength is scary. At least Lako and end Josh Ward are back. Lako is a one-man run defense — 9.5 of his 10 TFLs were non-sacks, and he was second on the team with 15 run stuffs. He was the only linebacker with a marginal efficiency below zero (as in, an offense’s marginal efficiency was negative when he made a tackle); he’s one of the best LBs in the MAC. Ward was more one-dimensional than Davis, who was equally strong against run and pass, but he’s still a decent pass rusher, and his ratio of havoc plays to tackles (35.3 percent) was second on the team and barely behind Davis (36.9). Ends Justin Sampson and Dylan Meeks both looked decent in limited opportunities, too. Depth is perilous, though. The leading returning tackler (Davon’te Jest) made just 10 tackles, and the second-leading linebacker after John Lako made just 13 (James King). It would take just a couple of injuries to nuke the front seven. There’s no way to assure that the run defense will improve any to offset the regression in pass defense. All-or-nothing. Place-kicker Nick Gasser was excellent, making almost every short kick and hitting over half of his FGs over 40 yards, and Jeremiah Knight was dynamite as a freshman punt returner (12.9 average, one TD, 73 percent return success rate), but iffy in kick returns. 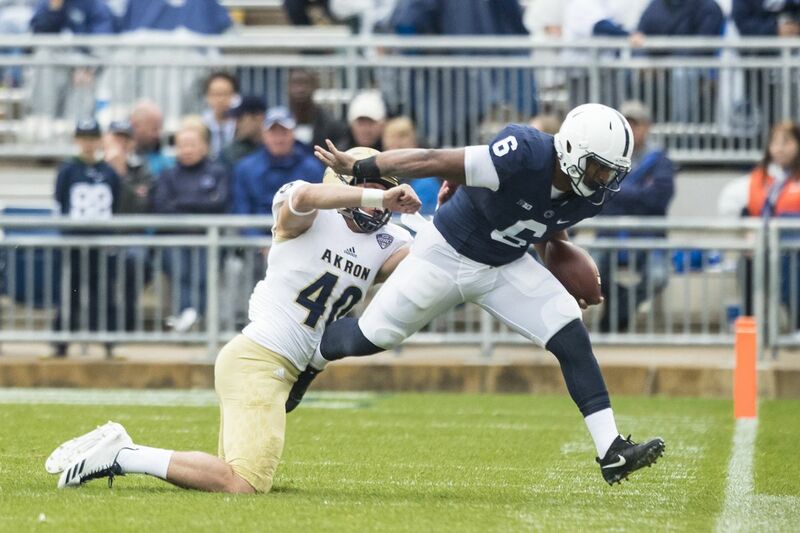 And Gasser’s punting was a significant issue, and, well, Akron punted a lot. With Gasser’s departure, Akron loses both a strength and a weakness, but in Knight, they return one of each, too (and he still has time to turn into as good a KR as PR). Still, there’s now a hole in the place-kicking department, and there’s no guaranteeing that Gasser’s replacement will be any better at punting. Arth will probably need a year to get the pieces, and that’s a shame, as the 2019 schedule could’ve been conducive for plenty of wins. UAB and Troy are on the non-conference schedule, but they both visit Akron, and the non-con road trips are less than daunting: at Illinois and at UMass. 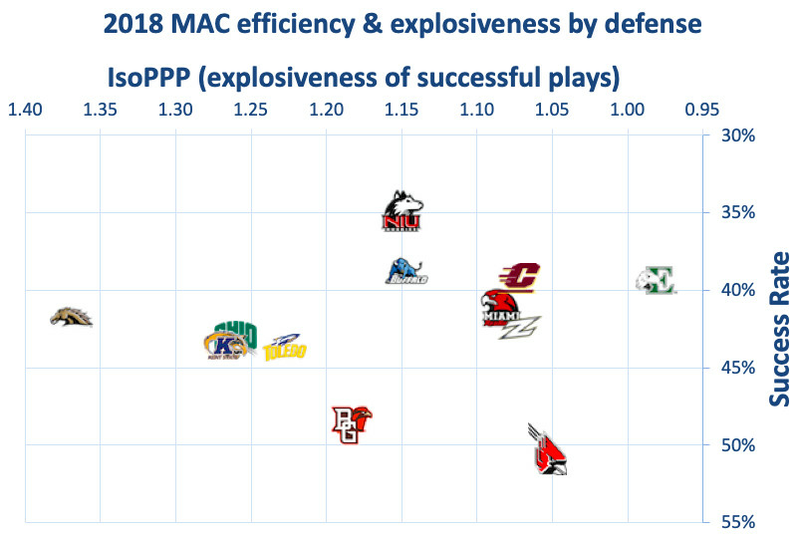 They avoid Toledo in conference play, get two of last year’s worst MAC teams (BGSU and CMU) on the road, and have four potentially winnable home games (Buffalo, EMU, Kent State, Ohio). A team playing at just a top-80 level might be able to win seven or more games against that schedule. But even if Arth turns out to be a massively successful hire, the Zips probably won’t have their act together until 2020 at the earliest. It’s not hard to feel optimistic, though. The offense should improve in 2019 and return almost all of the reasons, and while the defense will need a reset year, Feeney seems like a good hire for whatever the talent situation looks like. It’s easy to see what Akron likes about Arth, but hard jobs are hard jobs — Bowden may have been responsible for a couple of Akron’s best ever FBS teams, and even he couldn’t keep things moving in a positive direction for very long.